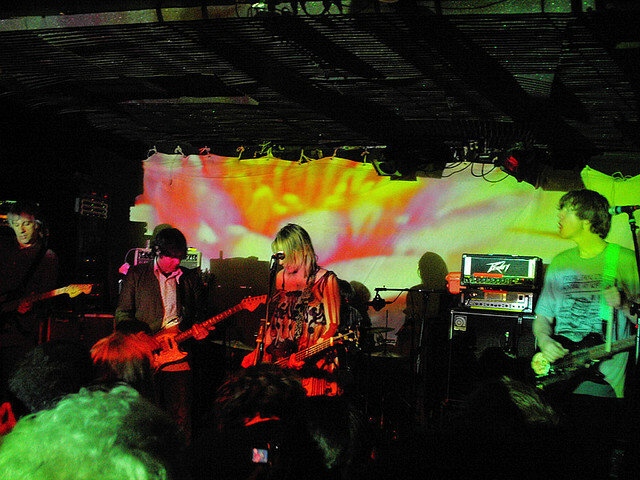 Sonic Youth at Maxwell's, 2005; Steve Shelley was a co-owner . The front bar at Maxwell's . Yo La Tengo at one of its celebrated Hanukkah shows, 2008 . 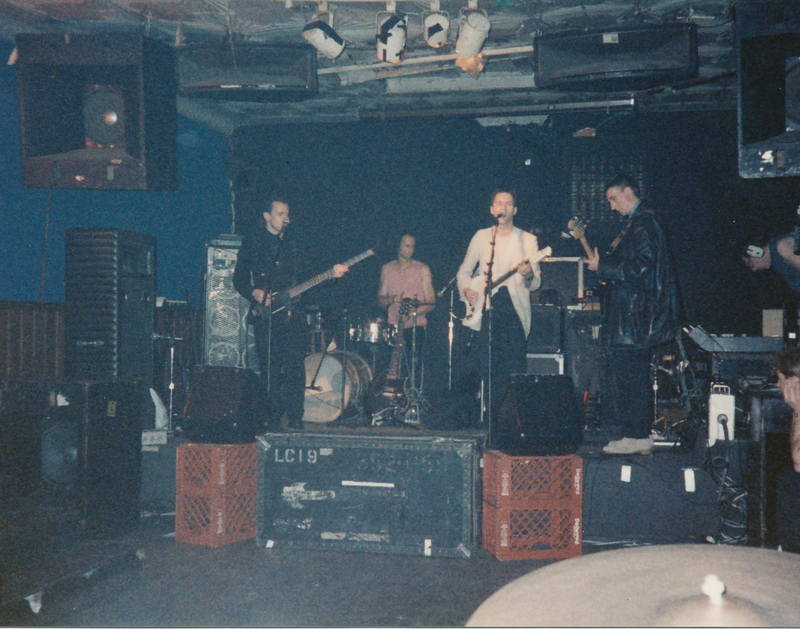 Wire soundcheck at Maxwell's, 1987 . 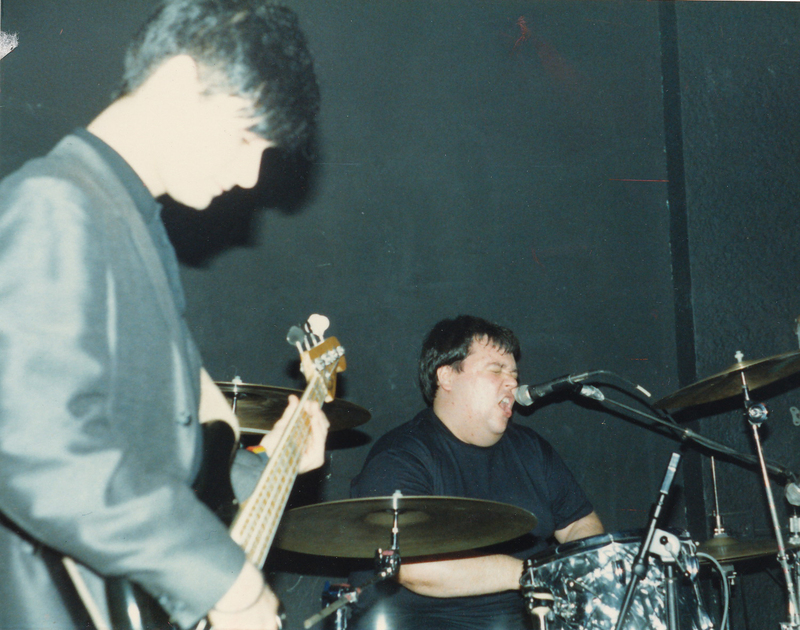 The Ex-Lion Tamers at Maxwell's, 1987 . 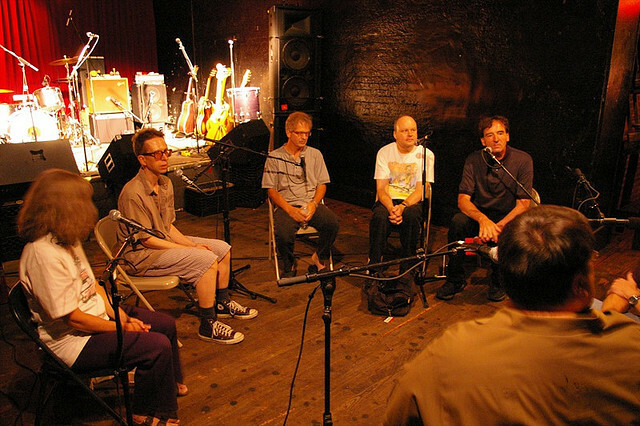 The Feelies interviewed for Sound Opinions at Maxwell's . Yesterday the unhappy whispers I first heard a few weeks ago from my buddy Jim “Jersey Beat” Testa officially became news: The legendary rock club Maxwell’s will close at the end of July. To say that the tiny (capacity: 200) club was the best in Hoboken, N.J. (population: 50,000) is meaningless. Nor does adding that it was for decades the finest music venue in the greater New York metropolitan region add much to understanding its importance. Now, consider that pretty much every important underground rock band in the last 35 years not only has played Maxwell’s but cited it among its favorite clubs in the world, and you’ll be starting to close in on what was special about the place. The brownstone on the corner of 11th and Washington just across the Hudson River from midtown Manhattan originally housed a shot-and-a-beer joint open only during break times for the Maxwell House Coffee factory down the block. That changed in the summer of 1978 when a visionary music fan named Steve Fallon bought the building with a couple of his relatives, cleaned up the bar (yes, there were ferns), and began showcasing bands in an intimate space in back that always had the vibe of a basement rec room. By the early’80s, the initial punk explosion ignited across the river at C.B.G.B. had fizzled out. But a new scene was being born at Maxwell’s. Yes, there was the Mile Square City’s brief time in the spotlight as “the New Liverpool,” the epicenter of a power-pop scene comprised of bands like the Bongos, the Feelies, the Individuals, and North Carolina immigrants the dB’s. 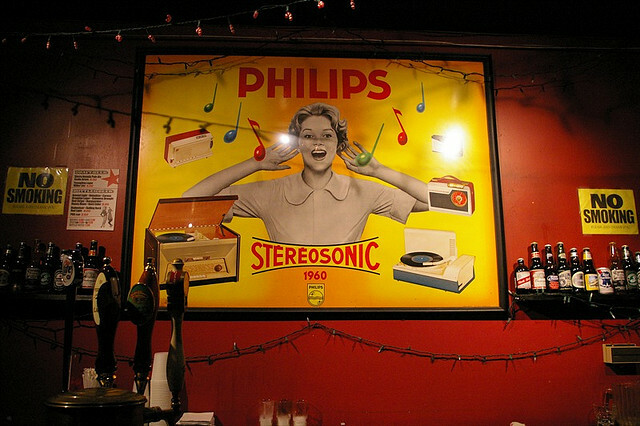 But more importantly, Maxwell’s became a key stop for touring rock bands on a musical underground railroad—a place that was a vital nexus of and inspiration for a burgeoning indie-rock community comprised of great record stores, college radio stations, and fanzines which laid the groundwork for alternative rock in the ’90s. Maxwell’s wasn’t the only club in that scene—other notables included the 9:30 Club in Washington, D.C., the 40 Watt Club in Athens, Ga., the Rat in Boston, and Lounge Ax here in Chicago—but it set the standard for all the others. Why? Despite the curmudgeonly exteriors of Fallon and Todd Abramson, who took over booking in the late ’80s, the club was fundamentally friendly and welcoming in a way that few others ever have been. Touring bands that had lived on peanut butter sandwiches for weeks were treated to a great meal from the kitchen (Fettuccine Maxwell’s a specialty) and free-flowing John Courage Ale on tap. The sound was exquisite, and the records that spun in between bands were amazing. And for years, groups that didn’t have a place to crash were invited to stay in an apartment upstairs. Musicians responded to this kindness in many ways. At different points, Peter Buck of R.E.M., Bob Mould of Hüsker Dü, and Steve Shelley of Sonic Youth were investors. Bruce Springsteen filmed the “Glory Days” video at the club with then-Hoboken resident John Sayles directing, and the Feelies did the same for “Away” with frequent club patron Jonathan Demme. Nirvana did a photo shoot there, and Guided by Voices and the Meat Puppets recorded live albums. Mostly, though, the bands just kept coming—playing in that tiny room of 200 even as they were selling out clubs 10 times the size in Manhattan just because, well, you had to say you had played at Maxwell’s. And this was true right to the end. 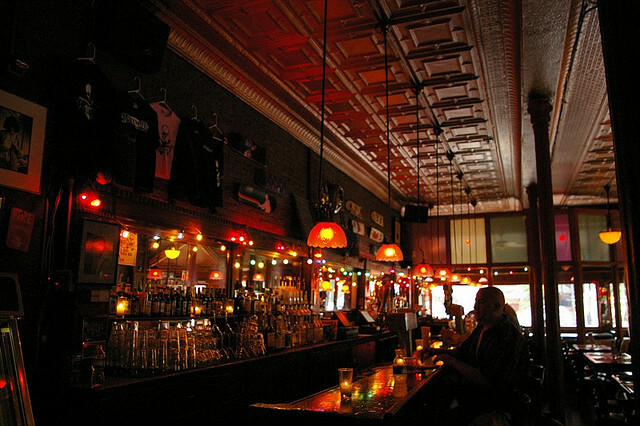 Maxwell’s died for the first time in late 1995 when Fallon sold out to a yuppie brewpub. (By then, the Maxwell House factory was gone—it’s luxury condos now—and so was the pungent smell of roasting coffee that always permeated the club.) But the brewpub tanked after about two years. Make no mistake: Every time I see that TV commercial with Iggy Pop and John Varvatos in a luxury car at the curb of 315 Bowery, my heart aches about what became of C.B.G.B. But for two decades or more before that famous venue closed in 2006, it had become a dreadful shadow of itself catering mostly to tourists and bands from Long Island. Two out of the last 35 years aside, that never happened to Maxwell’s. Hoboken did change, however. Throughout the period that I covered the city as a beat reporter for The Jersey Journal in the mid to late ’80s, it was a vibrant mix of Italian and hispanic working-class immigrants and younger bohemians driven out of Manhattan by escalating rents. It was a great place to work, live, and create—too great, as it turned out. By the time I moved to Chicago in 1992, T-shirts proclaiming “I Remember Hoboken When Hoboken Was Hoboken” already were a common sight in town. Today, that old Hoboken barely is recognizable post-gentrification. All rock institutions have their natural life spans, and seeing one continue past its prime is as sad as seeing one end prematurely. 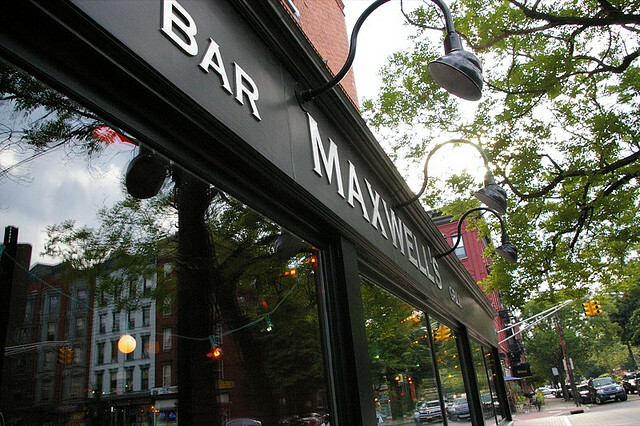 For Maxwell’s, perhaps the time to close is now; I don’t live in Hoboken anymore, so I can’t say. I live in Chicago, and I consider myself fortunate to have a long list of clubs I love almost as much: Schubas, Lincoln Hall, Metro, the Empty Bottle, Township, Reggie’s, and the Bottom Lounge among them. None of those venues have it easy, and as this blog often reports, it gets a little bit harder for all of them every day, with Chicago’s own gentrification compounded by the infuriating city bureaucracy, the murderous competition from giant corporate concert promoters and festivals, and the fickle loyalties of the live music audience. Here, the lesson is to appreciate what we have and do what we can do to assure that it thrives. Meanwhile, as with the late, lamented Lounge Ax, we can treasure our memories of unforgettable nights at an unforgettable club. Here are a dozen that spring to mind when I think of Maxwell’s. A memorable Maxwell’s show because it was my first; I snuck into the club with my friend and then-bandmate George Marrero without even knowing who was playing. The headliner turned out to be this Tom Verlaine/Talking Heads-style trio from Madison, Wisc. Since there only were a half dozen people in the crowd, the musicians handed out percussion instruments to everybody to become part of the show. I was hooked, and I continued sneaking into the club every weekend thereafter, regardless of who was on the bill. I saw dozens of great Feelies shows at Maxwell’s—it was their home away from home, and they played every holiday weekend—but this one stands out because it was the first, and because it was a bridge between the first album Crazy Rhythms (1980) and the second The Good Earth (1986), with the lineups that played on each of those discs joining together for the first and only time. Just before the release of Hootenanny, I wasn’t yet a full-fledged ’Mats fan, but I became one this night. After a great if messy set, most of the band left the stage, but leader Paul Westerberg wanted to keep going. A few punks in the audience wearing mohawks and leather jackets hopped onstage, Westerberg sat behind the drums, and they played “Louie Louie” for another 20 minutes. Replacements, indeed. As I remember it, Mould announced that the band had a new album coming out soon, and the trio was going to play it for us. We proceeded to get Zen Arcade in its entirety. This may also have been the New Year’s Eve show when, after Fallon locked the doors and kicked everybody but the regulars out, Mould and drummer Grant Hart amused the after-hours partiers by stripping to their underwear and wrestling in the middle of the club. Not to be outdone by the Hüskers, their SST label mates took the stage and D. Boon unfurled a six-foot-long scroll that he duct-taped to the wall as the band’s set list. It was Double Nickels on the Dime, performed from start to finish. The psychedelic troubadour had been to Maxwell’s earlier with the Soft Boys, but this show was memorable for being a solo gig on acoustic guitar and piano (no one who frequented the club ever thought that thing could work). We got an intensely personal and intimate reading of the material from I Often Dream of Trains, as well as some great John Lennon covers. Shifting from rock critic and Maxwell’s soundman to bandleader, Ira Kaplan introduced his new group with wife Georgia Hubley during a month-long mid-week residency. I saw every show, but not because Yo La Tengo was a great band yet; it was Maxwell’s, and where else would I be? My enduring memory is of Ira stopping the show for 10 minutes and sitting on the lip of the stage every time he broke a string and needed to replace it on his one guitar. For me, Sonic Youth was at its best when Bob Bert was behind the drums, circa Bad Moon Rising. To add to the clangorous din, he had stripped a mattress box spring and hung additional metal pipes on it, assaulting the thing throughout the show with a hammer. Afterwards, during load-out, the band left it unguarded for a minute on the sidewalk, and somebody actually stole it. Hoboken’s gentrification still was a ways in the future. This was the band’s second show on its first ever U.S. tour, when it played only new material. As a nod to fans who wanted to hear the older stuff, the group tapped my band the Ex-Lion Tamers to play all of Pink Flag. I had to scream some of the nastier songs like “Mr. Suit,” and after the first show in Philadelphia, I lost my voice. Georgia and Ira Yo La nursed me back to health by pumping me full of tea with lemon and honey. Sound Opinions did its first out-of-town event for our New York station WFUV with the Feelies at Maxwell’s in July 2008, shortly after the band reunited after a 17-year break. It felt like coming home again. Got a great Maxwell’s memory? I’d love to hear about it in the comments section. And follow me on Twitter @JimDeRogatis or join me on Facebook.